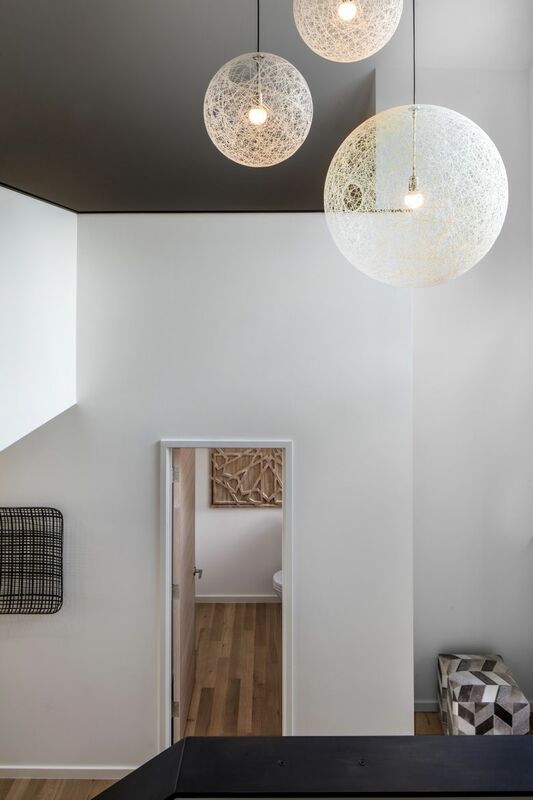 Interior designer Amy May creates functional, purposeful spaces for a couple whose children grew up and moved out. THERE WAS JUST one problem with the brand-new, wide-open layout of Kay and Bob Comiskey’s Normandy Park home: It was really open. They did not. But the Comiskeys are promenading on air these days, now that Bjarko|Serra Architects (who created those wide-open spaces) connected them with Amy May, of MAY Designs (who creatively filled those wide-open spaces). May didn’t have to look far for décor inspiration: Sand and saltwater shimmer forever, just outside a west-facing wall of windows. 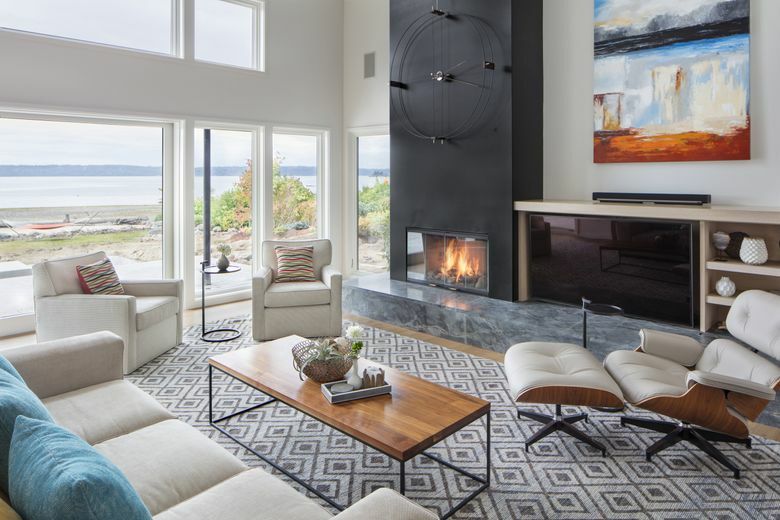 “The clients wanted to maintain a neutral palette that acted as a backdrop and setting for the natural beauty of the Puget Sound,” May says. And now, a beautiful blend of natural simplicity and industrial touches artfully flows through the re-imagined first floor, in driftwood, coral and beachy glass; color-popping art pieces; and all-new, fantastically functional furniture whose only movement is the occasional swivel of a purposely placed chair. 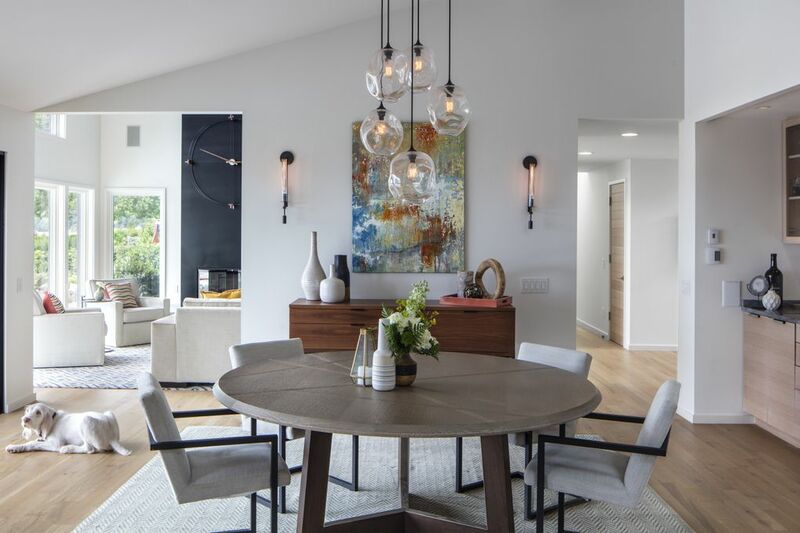 • In the dining room, the 6-foot-diameter table, of cerused rift oak with decorative inlays, “is round to inspire community and conversation,” May says. “This was arguably the most important piece in the plan because the dining room is visible from all the other rooms, and they plan to keep it forever.” Touches of bronze, on rods and sconces, “show off against the white walls and create an architectural feel,” she says, and each globe of the glass light fixture was handblown. “The dining room was a bit of an investment,” she says. 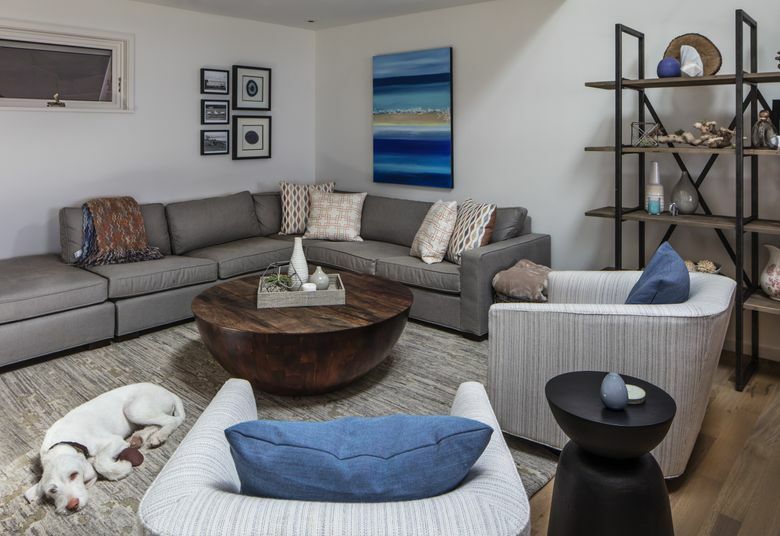 • And in the adjacent family room, “More swivel chairs turn 360 degrees so you can turn to be a part of a kitchen gathering,” May says, and a round, concave coffee table of reclaimed wood (perfect for jigsaw puzzles) doubles as an ottoman. There’s also a versatile, gray sectional anchoring the corner, but this sectional is not moving — not for a while, anyway.